Having an application which is free from platform restrictions to extend the reach of your business. Owing to the consistent advancement in the technology, we have witnessed a proliferation of mobile platforms, the cumulative costs required for building and maintaining, native and unique solutions for each platform have certainly spiked up. Hence, the latest trend for mobile apps which can cater to variable market and business needs is building them as cross-platform applications to make it more cost-effective and effort-efficient. 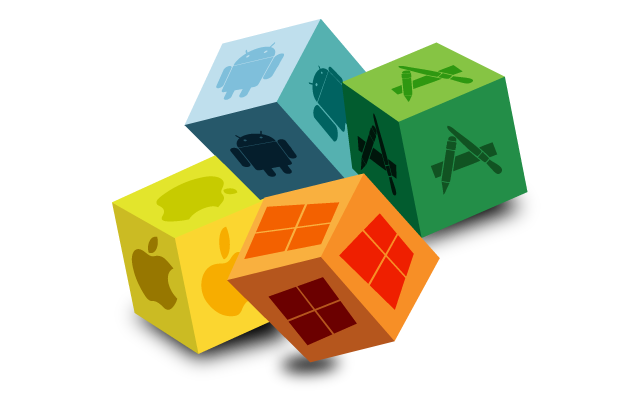 The development team at WonderSoft Multimedia Solutions is skilled at developing cross-platform applications for all the leading mobile operating systems including Android, iOS, BlackBerry and Windows. What makes us your sensible choice? WMS has been in the business of developing mobile and web applications for a while now. We intricately understand your requirement and validate the requirement of a cross platform application for your business. We are among the top cross platform mobile application companies in India because of our team of cross platform developers and HTML5 experts. We understand that each platform is unique with different attributes and capabilities. So, we carefully analyse and craft your application which guarantees it to function at full potential for every platform. WMS has been credited with several beautiful, usable, real-world applications. We thoroughly test the developed app through unit testing, test automation, various platform tests and devices, responsive tests, etc. before the app sees the light of the day. When we undertake an app development we aim for a better user experience in terms of functionality, improved usability and interactive designs. We are diligent towards delivering application which are great at performance along with being super-fast. WMS cross-platform development services range from m-Commerce to healthcare, from social networking apps to complex enterprise level apps. We don’t just develop applications for you, but we also take a mobile application to market, enrol it in developer Program, configuring technologies that are available only to App Store applications and testing app on multiple devices and system versions. We are definitely the whole package! We implement an agile development methodology which helps us deliver amazing cross-platform mobile applications to our clients. We are in the business to accumulate good clientele and offer them our niche services. With better communication and quick turnaround times, we deliver the best interactive applications to you. We don’t just want to develop cross-platform applications for you, but we also want assured customer satisfaction and continuous improvement for all your apps. So we offer post development support to you anytime you want it. WonderSoft Multimedia Solutions is an organization of expert cross-platform developers who can offer your users an amazing, multi-platform based experience that will meet your business, industry and vertical needs. We have garnered an impressive clientele over the years because of our dedicated team, competent account managers, experienced project manager and consistent delivery the team provided. Take a look at our clients! Seeking for some awesome cross-platform Applications? WMS is absolutely unmatched at developing cross-platform mobile and web applications which perfectly cater to you, because we understand your business goals. So, give us a call and be ready for a versatile cross-platform application development!